A.J. Fernandez was raised in Cuba surrounded by the rich tradition of the Fernandez cigar legacy. 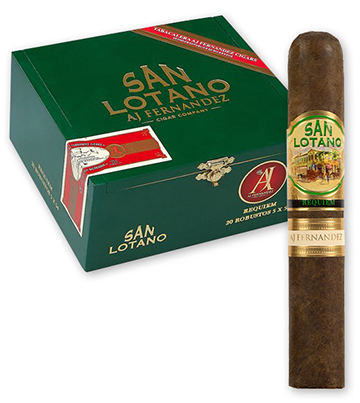 San Lotano Requiem Habano cigars are hand-rolled in Esteli, Nicaragua, at Tabacalera Fernandez under A.J. 's watchful eye to ensure superior quality. The San Lotano Requiem Habano is specially blended with a Nicaraguan binder and Nicaraguan, Honduran, and Dominican fillers for the full-bodied cigar fan. The strong, perfectly balanced Habano offers a rich, robust flavor and memorable finish. Perhaps the most unique aspect of the Habano blend is its rare Cuban seed and ligero wrapper grown only in Brazil by the Fuego family. The construction, burn, and flavor profile of the San Lotano Requiem Habano line truly shine a spotlight on A.J. Fernandez' cigar blending skills.